I’ve been saying goodbyes for the last few weeks—to people and places—and though I’m no drinker, I’ve often thought that a good swig of something strong would ease the process. True, I’ll be back here soon and often (I don’t deserve your pity as I have three trips to Ireland planned in the next thirteen months), but I won’t be living in Ireland for an extended period in the foreseeable future, and that makes me sad. To end our sabbatical year, Ron and I planned a two week trip hitting favorite spots from past trips and including places we’ve always wanted to see. 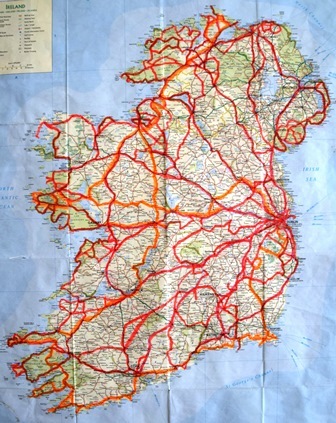 In spite of all the roads and lanes we’ve gone down in the last year (see map: the orange line shows our last trip, the pink lines show trips we’ve taken this year), as we drove around the country we couldn’t help but compile a new list—all the places we still want to visit, all the things we still want to do, all the towns, beaches, high crosses, pubs and restaurants, museums, lighthouses, monastic sites, lakes, mountains, birthplaces and graves, prisons, Big Houses, guided walks, and many more places and experiences we haven’t been able to fit it, not to mention all those we haven’t yet discovered. When I started this blog last July, I wrote, “Over the coming year, I expect everything I think I know about this country to change—or at least to grow new roots and shoots”—possibly the understatement of the century. I haven’t even begun to take account of how much I’ve learned and, as an outcome of that learning and of being away from home, how much I’ve changed. Much of that transformation has been due to the travel, research, lectures, courses, reading, conversations, etc. that I have been able to plunge into this year. But a good deal of the transformation has come from the writing itself. This year I wrote fifty-two essays—some quite short, others rather long—and nearly 80,000 words. I’m proud of those numbers. While I had a lot to learn, I also discovered that I had a lot to say, and figuring out how to say it as best I could on a very tight schedule that I set for myself (post every Monday)–with a reading audience that responded immediately on Facebook, on the blog site, and via email–pushed me and motivated me more than any writing project has ever done. As a writing teacher, I take that lesson to heart and will try to incorporate aspects of this process in my teaching in some way. In due course, in some form or other, I hope to try to explore and explain what I’ve learned this year. Where they will fly to, where they will land, I can’t yet say. . .
Oh, how I’ll miss this blog. Monday mornings will not be the same without the chime indicating a new post by my dear Christine. Thank you for sharing your year in Ireland. Your words, your stories and lessons, were passionate and intimate, and highly entertaining. Please continue the blog. I want to see the view from wherever you are!! Sending love and wishing you and Ron safe travels. Thank you, loyal reader! Hope you are mending well and staring down all flying tree limbs! Has it been a year already? I can’t wait to see where you go from here. I have enjoyed every word. Thank you! Alfreda! Great to know you are out there reading. Christine, I LOVED your blog — you are such a talented writer and anything about Ireland warms my heart too. Glad we have reconnected — let’s keep that going! Hello. It’s nice to see there are still Tim Robinson fans out there. My family and friends have been worried about me for years as I am always making them listen to wonderful passages from his amazing books. I read and re-read them. They do read like poetry. My wife and have visited Ireland some 18 times over the past 40 years. We stayed at St. Joseph’s in Roundstone a few years back. Our host, Christine, introduced us to a local artist, Rosie McGurran, who gave us a tour of her studio. Then on learning of my obsession with all things T.R., she called him! And, he left his house and came to his studio and gave us a tour. I am still thrilled. We’re going back at the end of March. I believe he no longer lives in Roundstone. We hope to hike up Erris Beg at dawn. Weather permitting. Then we’re back in October, including two nights in Cill Ronan. So, enough…I could go on all day.